The reaction of CO2 dissolved in seawater with Ca and Mg silicate minerals in basalt can result in the formation of calcium and magnesium carbonates within the basalt (Staudigal et al., 1989). This is an additional process that could affect atmospheric CO2, because oceanic and atmospheric CO2 are in exchange contact. Some carbon cycle models include this process as a major control on CO2 (Brady and Gislason, 1997; Sleep and Zahnle, 2001; Wallmann, 2001). The idea is simply that if atmospheric CO 2 rises, the concentration in the ocean rises, and there is enhanced uptake by submarine basalt weathering. In this way the process serves as a negative feedback for stabilizing atmospheric CO2, and, in combination with silicate weathering on the continents, this would lead to greater dampening of CO2 fluctuations over time. This process would have provided a more important feedback during the Precambrian (Sleep and Zahnle, 2001) because of a thermally enhanced mantle-crust-ocean-atmosphere carbon cycle in the early earth. Furthermore, Brady and Gislason (1997) have suggested that increases in deep sea temperature, due to the greenhouse effect of elevated CO2, could lead to increased submarine basalt weathering and thereby act as an additional negative feedback. 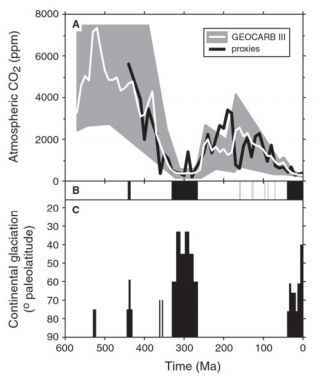 CaCO 3 in submarine basalts given by Alt and Teagle, insertion of this degree of submarine weathering in the GEOCARB model (Berner and Kothavala, 2001) results in a very minor change in calculated CO2 levels. During the distant geologic past, submarine basalt weathering may have been more important than at present. In the present oceans more carbonate is deposited in deep sea sediments than in submarine basalts, and the carbonates later join in contributing to CO2 degassing during subduction, but with basaltic carbonate being a lesser contributor. During the period before 150 Ma when there is little evidence for deep sea carbonate deposition (see chapters 3 and 4), it is possible that the subduction of basaltic carbonate could have been a more important factor in global degassing and in changes of atmospheric CO2 level. What are the process that change the submarine weathering?